Finally I feel I have settled in enough to write. A few days ago we returned from a 3 week trip which turned into a 4 week trip to Durban and Jo'burg, the purpose being to let Rio have a real 5th birthday party with his friends. It involved much moving and packing and squatting in friends houses but in retrospect it was just what I needed emotionally. I have arrived back feeling infinitely better than when I left and am quite enjoying this place, having the correct head-space. I can immediately sense a change in Rio as well. Within 3 days of leaving Moremi he stopped his incessant high-pitched humming to himself. The silence was blissful and only once it had stopped did I become aware of how demented it had been making me and I felt some semblance of sanity return. The Surfside Gang in Dbn gave him a hero’s welcome, running the full length of the field en masse, arms open, shrieking his name as they saw him walking down the side stairs. It was beautiful and I was practically in tears. It only took him a few minutes to regain his usual self and play as if he had never been away. Durban was a bit of a social whirl and Dylan and him got on very well, contrary to my expectations as they have a history of bugging each other. Over the next few days Rio proceeded to get worse, with the fever breaking sporadically, and it became clear that it wasn’t chicken pox. By this time he had a severe rash on his face and torso, occasionally spreading to his limbs. 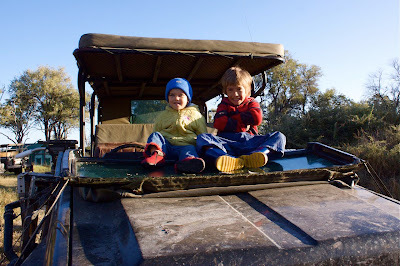 On Wednesday 25, the day of his 5th birthday we bundled them into the car and drove back down to Jhb. By this stage Keita was ill as well and had had sporadic fevers since the day before. She was also showing the first signs of the strange rash. Both of them were so ill on the drive that they literally couldn’t get out of the car even to have a wee break. We drove them straight to Neli (our pediatrician since Rio was born) at the Parklane Clinic. She took one look at the limp, red-spotted, moaning figures that Brad and I had carried in to her consulting room and declared them to be extremely ill and, after a thorough examination each, said her guess was typhoid. She admitted them as outpatients to the pediatric ward, ordered immediate blood tests (which she had to do herself due to the slippery nature of Rio’s veins) and put them on a 5 days course of intravenous Rocephin. Then we were in hell. The kids shrieked and screamed as if their limbs were being amputated and it didn’t get any better. Brad was patently shaken by this whole thing, being unused to seeing such things. That night Rio was as sick as I have ever seen him, feverish, moaning and clutching his head complaining of intense pain. It was unbelievably stressful. The malaria and typhoid tests had come back negative and we were all at a loss. The results did show his system was fighting something but we had no idea at that stage whether it was viral or bacterial. At 10 pm I had Neli on the phone as I feared my inexplicable lifelong terror of meningitis was beginning to make sense. Neli, although very concerned, explained that they were on the biggest does of the most powerful antibiotic and there was nothing more we could do. We had given him Voltaren and Impeped suppositories and all we could do was wait and see. In her opinion it was unlikely to be meningitis because he would have been dead already, but if it was he was on the correct dose of antibiotic. If it was incephalitis then it is viral and there is nothing we can do anyway and basically all we could do was wait until morning and see if there was any improvement. The next morning he was a little better but the rash persisted for a few more days, as did the fever. Both children had to go back every day for 5 days for their daily dose of intravenous antibiotics and twice the doctors had to resite the drips, so all in all it was a hideously traumatic time for all involved. Keita's rash lasted much longer, but her illness seemed to be much lower grade, taking about 2 weeks to clear, but without the same terrifying fevers as Rio. They both had terrible diarrhea. After thousands of rands of blood tests later we had no diagnosis and it continues to be a mystery. We know what it wasn’t, but have no idea what it was. As it didn’t respond very well to the massive doses of Rocephin we suspect a virus, but nobody around them contracted anything despite the fact that we had been living so closely with people, so it was all very odd. As soon as we were sure that the antibiotics hadn’t been masking any symptoms and they were both well again we returned to Moremi. And here we are. Back home.